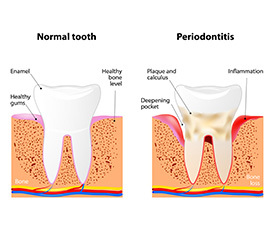 Gum disease is one of the most common health conditions affecting adults today, with over half of the population suffering from a mild to severe form. While symptoms at first may be relatively harmless, patients can experience serious consequences, including soft tissue deterioration and tooth loss, if they do not pursue treatment. That is why Dr. Barsky and his team take this threat seriously. A thorough gum inspection is an important component of your regular checkups. If we discover troubling signs of gum disease, we offer several personalized therapy options depending on the severity of the case, including more frequent cleanings, scaling and root planing and more advanced treatments. One of our skilled dental hygienists performs scaling and root planing to remove plaque and tartar that build up on teeth above and below the gum line. This buildup traps the bacteria that cause gum disease. We use an ultrasonic cleaner to eliminate plaque and tartar, and then smooth, or plane, teeth surfaces to prevent plaque from accumulating again and to allow gum tissue to heal.